Mustad open eye 3X strong treble. A solid hook that comes standard on most wooden plugs today. Excellent application for when split rings aren't used. 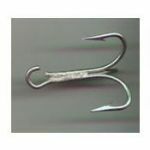 Can be easily closed with pliers on swivel or hook hanger. Great for replacing rusted or bent hooks on old plugs or as new on custom plugs.